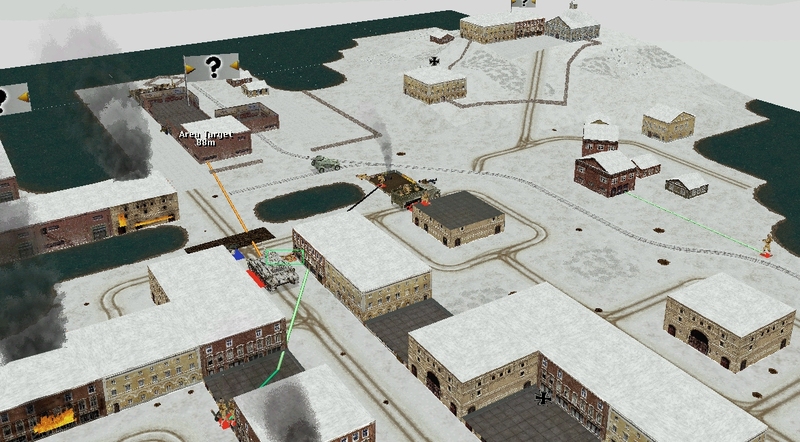 The third communal Combat Mission skirmish – a comment-driven confrontation between RPS readers and Combat Mission: Barbarossa to Berlin’s uncommonly entertaining AI – has three turns left to run. By the end of the weekend the commenter-controlled Soviets will either be celebrating a memorable eleventh-hour victory or rueing opportunities/wharves not taken. The comment commanders can smell the seaweedy tang of the Baltic, but their men are exhausted, their vehicles few. If they are to seize the key dockside VLs before the Kriegsmarine evacuation flotilla rounds the headland, it’s vital they make progress in turn 28. The M5 and OT-34 trade fusilades in the first few seconds of the turn – verbal fusilades. Flare Path’s driver resents having to give way, but give way he does. He reverses to allow the M5 halftrack to squeeze past, unaware of the fleeting drama unfolding behind him. Alarmed by the Soviet riflemen approaching from the SE, the SS light-machinegunner in n16 has bolted for l16. Seven rifles and an SMG track the retreater as he dashes across the street, but the man with the doppelte Siegrune on helmet and collar has the luck of the Devil. 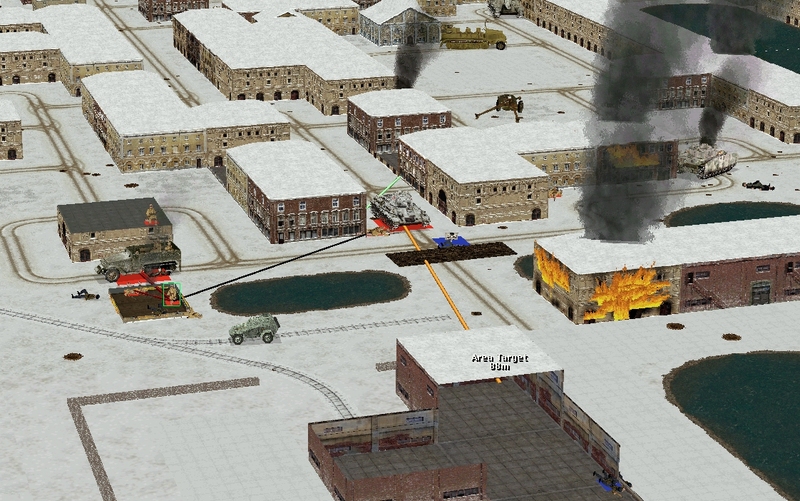 Once the pitted flank of the halftrack is out of the way, Flare Path resumes her vandalism of the building due-west at l9. Almost immediately the façade-roaming MG bursts produce results. Nine Luftwaffe infantrymen spill onto the dockside, possibly intending to scamper south to New Wharf. Waiting for a taxi at k13, Myshkov’s 3 Squad notice the bid and scupper it with rifle fire. Soviet slugs drop two hunched figures forcing the LW squad to retrace its steps. Myshkov’s 1 Squad are close enough to their targets to hear their hoarse whispers and hurried magazine changes. In the wooden two-storey hut at j12, the remains of a German platoon HQ – two men – are holding off seven seasoned pioneers. Make that six pioneers. By the time Myshkov arrives, the building has been set ablaze by a Russian grenade and 1 Squad, a man down, is looking anxious. The lieutenant takes in the situation in an instant. A series of hand-signals puts in motion an aggressive pincer movement that ends in a brutal, bayonet-point quadrille. The fighting is every bit as intense, every bit as intimate, down at the riverside warehouse. Cracks are beginning to craze Kpt. Gurtiev’s mantle of calm, when Ryumin’s 1 Squad arrives from West Bridge. *plus whatever the unidentified Axis unit in the west wing is packing. ^ (Click to enlarge) j12 is clear and Myshkov’s 3 Squad is aboard the halftrack. The LW squad on Old Wharf has retreated to the SE corner of l7. The mortar barrage centred on m13 has subsided but something – I’m not quite sure what – ‘pinned’ Myshkov’s 2 Squad close to Flare Path in the final few seconds of the turn. ^ (Click to enlarge) Our AT team is just over halfway to g14. Castle, Old Wharf, and New Wharf are, presumably, still in German hands.